…from the exhibition Cairo to Constantinople: Early Photographs of the Middle East, at The Queen’s Gallery, Palace of Holyroodhouse, 8 March – 21 July 2013 and at The Queen’s Gallery, Buckingham Palace, October 2014 – February 2015. This astonishing, carefully-archaeological and very attractive Victorian frame, made for an Egyptian stela of 3rd century BC, is one of the items in an exhibition based on a tour of the Middle East made by the young Prince of Wales in 1862. The 20 year-old Prince, later Edward VII, had only recently lost his father, Prince Albert (on 14 December 1861); however, the Middle Eastern tour was of enough political significance for it to go ahead, the Prince’s friendly relationship with the Viceroy of Egypt being particularly important. After travelling through France, Germany and Austria to Venice, the Prince’s party continued by boat via Dalmatia and Corfu to Alexandria, arriving on 1st March 1862. It contained the first Royal photographer to take part in such a tour – Francis Bedford; he recorded the entire trip, and these photos form the basis of the exhibition Cairo to Constantinople. The Royal party spent March 15th-20th in Luxor, and on 18th the Prince visited a dig at the Memnonium in Thebes. His journal records the visit, and the fact that the Viceroy of Egypt was allowing him to have anything of interest which was found that day; he received ‘a small mummy’ and the wooden funerary stela. Details of the stela and its conservation can be found online, in the pages dealing with the exhibition. The tour had a large cultural component, as well as political ends; the Prince busily visited museums, galleries and temples throughout the four months of his tour, and was obviously very alive to the rarity and value of the stela, commissioning the frame, above, which has contained it ever since. The genesis and manufacture of such a unique design, is, however, almost completely undocumented, and it is due to the inclusion of the stela in the exhibition based on the Prince’s tour that the production of the frame is now being examined. The only clue which it offers is the label on the backboard, of ‘Phillips,/23 Cockspur St/ London’, beneath the Royal crown. This is the label of the jewellers, Phillips Brothers, also known as Robert Phillips, founded by Robert and his brother Magnus at some point before 1839. According to the 1841 census, Magnus was much older than Robert (40 to his 26), and was classified as a silversmith, whilst Robert was a watch maker. Magnus died in 1847, and the 1851 census records Robert, by now 36, as having been born in Abergavenny, Monmouth, and describes him as a goldsmith and jeweller. Magnus’s place in the business is later filled by Robert’s son, Alfred (born 1845/46). In 1869 the name of the firm changes to Phillips Brothers & Son to reflect Alfred’s becoming a partner with his father; he takes over completely in 1884, Robert having died in 1881. This means that the label (unless slightly out of date, which may be unlikely on a Royal commission), gives an end date for the frame of 1869, because of the name change; the Prince’s tour itself giving an earliest date of summer, 1862. Mary Haweis mentions ‘Messrs Phillips of Cockspur Street’ in her 1878 book, The Art Of Beauty: ‘Under the direction of Messrs Phillips, the most perfect models are sought for the ornaments they furnish. Museums and picture galleries are ransacked for devices of necklaces, earrings and pendants…. I saw facsimiles of exquisite Etruscan and Greek collars in gold, every detail being carefully studied, and reproduced after the manner of the ancients.’ This archaeological accuracy seems to have lapsed with Alfred’s accession to the business, but from the 1840s to the beginning of the ’80s, it was one of the driving forces behind the firm. This was in tune with the Victorian interest in historical revivals. Owen Jones’s Grammar of Ornament, published in 1856, was both a symptom and a stimulus of the thirst for knowledge of the past, like the sudden fashion for Anglo-Saxon Christian names (all those Aethelwalds and Cuthberts), and the popularity of Renaissance revival furniture in the 1851 Great Exhibition. The enthusiasm for Egyptology in particular increased markedly during the 19th century. The British Museum, founded in 1753 and opened to the public in 1759, had been steadily creating its own purpose-built home in Bloomsbury between the 1820s and the 1850s, the Egyptian Galleries being constructed from 1825-34. The Museum had acquired the Rosetta Stone in 1802, which was added to the original 150 Egyptian objects from the collection of Sir Hans Sloane it had owned since its foundation; acquisitions gradually accumulated and by the 1860s its holding in this department was about 10,000 objects. British travellers had begun to visit Egyptian sites from the early 19th century, and by the time that Jones published his collection of a hundred and twelve plates of densely-packed ornamental motifs from around the world, he was able to include Egyptian examples not only from the British Museum and the Louvre, but from the temples and tombs at Thebes. The most interesting of Jones’s Egyptian plates, in connection with the frame of the stela, is No. 4 or Plate VII in the book. This is made up of blocks and bands of running decoration, much of it from ‘the walls of tombs and temples’ (a number of which are in Thebes), and many examples of which are ‘derived from the same elements, viz. the Lotus in a pendent position, with a bunch of grapes intervening’. No. 12 in Plate VII, which is the upper part of the third block down on the left-hand side of the page, is almost identical to the decoration of the top moulding and frieze of the frame, whilst the roundels with centre dots on the sight moulding can be seen in No.21 on the plate – the block immediately below Nos.12/13. Both of these blocks of ornament are labelled by Jones as ‘From the Tombs, Gourna [Thebes]’. The band of red, green, and yellow oblongs with black-&-white dividers is also very similar to the band painted across the stela itself, immediately beneath the figure scene and around three sides of its perimeter. The closeness of the decoration of the frame both to elements of the stela itself and to Jones’s reproduction of motifs from the location where the stela had been found, shows that the designer of the frame was well aware of the provenance and rarity of the stela, and had the knowledge to create an appropriate setting for it; he also had the means to research ‘authentic’ decoration for that setting. Along with the label on the reverse of the stela, this puts the ball firmly into Robert Phillips’s court, which is just what the Prince of Wales seems to have done. Detail of a necklace atributed to Phillips Brothers, 1862-63, scarabs dating from c.1600-650 BC; Royal Collection Trust © 2013, Her Majesty Queen Elizabeth II. Detail of the crest of the ‘Egyptian’ frame, with winged solar disc held between two snakes. As well as the stela and the ‘small mummy’, the Prince had been presented with a set of ancient scarabs; he commissioned a necklace from Phillips into which the scarabs were set, and gave it to his bride, Princess Alexandra of Denmark, whom he married in 1863, the year after his expedition. Each scarab has been set in gold, and hangs from a miniature winged solar disc held between two S-shaped snakes, just like the enlarged version which crowns the frame. The agence of Robert Phillips in the production of the frame is therefore, from all the evidence, almost certain. However, Phillips was a jeweller. He worked on microscopic productions of tiny forged links and delicate engraved decoration. His work rooms would not have been equipped to make something of wood, gesso and gold leaf on the scale of this frame; and although he and his workers possessed enviable skills, they were not the right skills for framemaking. He must have drawn the design, and then contracted it out. There are three possible framemakers to whom he might have turned. One was Joseph Green the younger (1808-73) of Charles Street, north of Oxford Street; framemaker to the Pre-Raphaelites and son of such an expert carver that the latter supplied the compo ornament maker, George Jackson with carved boxwood moulds. A second was William Brooks (c.1799-c.1871) of Lincoln’s Inn Fields, who was appointed carver and gilder to Queen Victoria in 1863 (but who had himself been a customer of George Jackson’s in the 1830s & ’40s). The third was the firm of Foord & Dickinson (Charles Foord, c.1836-92, & William Dickinson, c.1816-74) of Wardour Street, framemakers to the National Portrait Gallery, and to DG Rossetti, Holman Hunt, the ‘second wave’ Pre-Raphaelites & the Olympians, who took over Green’s clients, following his retirement. Green is included amongst the candidates because he was the most innovatory framemaker in London from the late 1840s, carrying out designs for the Pre-Raphaelites which were extremely avant-garde for their time (see ‘Pre-Raphaelite frames’ for Holman Hunt’s The hireling shepherd, the frame of which was probably executed by Green in 1852, and The awakening conscience, definitely by Green and executed in 1854). He may well have worked for Ford Madox Brown from 1846-47, as the latter’s studio in Clipstone Street was only four streets north of Green’s workshop in Charles Street, and as he certainly produced the frame of Rossetti’s Self-portrait drawing of 1847, NPG, probably framed 1848 when Rossetti was briefly a pupil of Brown’s. He made the frame for Hunt’s The scapegoat, in 1855 (see ‘More Pre-Raphaelite frames’), and this is relevant to the production of the Egyptian frame, since the low-relief motifs carved onto the rails of The scapegoat were actually cut into the thick layer of gesso which coats it, rather than into the wood, and it seems likely that this is how some of the decoration of the Egyptian frame was also achieved. From the point of view of training, innovation and technique, therefore, Green looks a very probable contender. However, there are no discoverable bills of the 1860s from Green in the Royal Archives; the workshop in Charles Street was a long way north of Cockspur Street, and there are indications that, by the mid-1860s onwards, Green may have become progressively less in control of his business. He had been appointed carver and gilder to Queen Victoria in 1863, as noted above, and this appointment was carried through, in the person of his son, William Elliott Brooks, into the reign of Edward VII, the quondam Prince of Wales. Brooks was about nine years older than Green, and a much more conservative framemaker; he would have suited the Queen more in this respect. In the Post Office London Directory for 1852, he is entered as ‘Brooks Wm. carver & gilder, 14 Gt Queen st. Lincoln’s inn flds’, but in the census of the previous year he is described as a ‘Picture Frame Maker Employs 4 Men’, which seems to sum up his relationship to Green, who is described as ‘Carver Gilder’ who was currently employing eleven men. The overwhelming impression gathered from the recorded scope of his work is that William Brooks was much more a maker of conventional and academic frames decorated with composition ornament than he was an imaginative trailblazer producing handcarved, original designs. 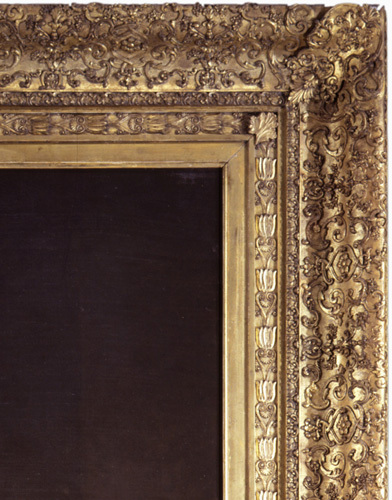 The Directory of British Framemakers notes that the frames he produced for the Royal Collection were ‘Lawrence frames’ (see Jacob Simon’s essay, ‘Thomas Lawrence and picture framing’, page 2) and ‘Alhambra frames’, both of which were encrusted with a restless surface skin of compo decoration. One of his creations was destined for a portrait by Winterhalter – not an artist ever knowingly under-ornamented with compo in the frame area. It had the same second-generational continuity to it of Joseph Green, father and son: Charles Foord was the son of George Foord, who had died in 1842 when his son was only about 6; the business had been run by Charles’s mother for the next 14 years, probably heavily reliant upon her foreman William Dickinson, a carver and gilder from Hampshire, who had been in his mid-twenties when George Foord died. For a brief space after Elizabeth Foord’s own death in 1856, the business was owned by her three daughters and run by Dickinson; it then passed to Charles Foord and Dickinson in partnership. The firm had a history under George Foord of working for institutions such as the Society of Painters in Water-Colour and the Royal Manchester Institution; from 1857 it worked for the National Portrait Gallery and occasionally for the National Gallery. It was also employed by rather less academic and more outré artists than perhaps Brooks was, working during the 1860s for Frederic Sandys and Holman Hunt. Foord & Dickinson’s work for the National Gallery and its work for Hunt are particularly interesting in this context: the National Gallery commissioned a frame from Foord’s in 1858 for a pair of pictures attributed to Quinten Massys, Christ and The Virgin, which had been designed by Owen Jones, whilst Hunt probably used Foord & Dickinson to make the frame of The lantern-maker’s courtship, in 1861, and that for the small version of The afterglow in Egypt, in 1863, the medallions on both of which are based upon the central roundel of ‘Arabian No. 5’, or Plate XXXV of Jones’s The Grammar of Ornament. In other words, Foord & Dickinson were already as familiar with Owen Jones and his Grammar… as Robert Phillips would have been; in fact it was extremely likely that they all knew each other personally, since Jones would almost certainly have liased with the makers of the Massys frame for the National Gallery, and Phillips’s archaeological enthusiasm would just have certainly have introduced him to the author of such a treasure-house of archaic designs as Jones. Phillips and Foord & Dickinson were also conveniently close to each other; certainly nearer than Phillips was either to Green or to Brooks. Foord & Dickinson’s location in Wardour Street has been shrouded in complications engendered by the knocking down of so many buildings, renumbering, and the fact that only the houses and businesses on the west side seem to have been recorded. In order for the view to make sense, the artist must have been in the building marked in red on the map below, the wall in the painting being that running along the south side of Old Compton Street and forming the northern boundary of St Anne’s churchyard. The church itself would be out of view on the left in the painting, and the houses would be the backs of those on the north side of King Street. This means that Foord & Dickinson were located at the south end of Wardour Street, at the junction with Princes Street, Old Compton Street and Pultney Street. This was very accessible to Phillips in Cockspur Street: a direct walk down Prince’s Street and Whitecomb Street, with the National Gallery on the left and Phillips across the road to the right – convenient for both firms involved in the creation of such an important design as the frame for the stela. Exposure to the pioneering work of Owen Jones, through the commissions from the National Gallery, Holman Hunt, and – now almost certainly – this Egyptian Revival frame for the Prince of Wales, stood Foord & Dickinson in good stead with regard to the arrival of the so-called Olympian painters, especially from 1870 onwards. It was the firm which shone most brightly in the opulent setting of the Grosvenor Gallery, from 1877, supplying some of the great aedicular frames of the last quarter of the century, to Burne-Jones (The Days of Creation, 1872-76; The story of Troy, 1878-90), and Leighton (Fatidica, 1894), as well as framing the work of Whistler, Albert Moore and Edward Lear. As Rossetti was to write in 1876, ‘it is evident that F. and D. are the only frame makers’. I am extremely grateful to Alessandro Nasini, Collections Information Assistant at the Royal Collection, Windsor Castle, who alerted me to the frame of the stela, and to the Royal Collection and the Royal Archives for permission to publish images of the stela & frame and the detail of Queen Alexandra’s necklace. I am also grateful to the respective museums for permission to publish comparative details from works by Holman Hunt & Leighton, and for the images from the British Museum; also for other online images which have been individually cited. This article is underpinned by and greatly indebted to the enormous amount of information on the respective framemakers available in Jacob Simon’s Directory of British Framemakers, National Portrait Gallery website. The Prince’s Journal for the tour, 6 February-14 June 1862, can be read online at the Royal Collection. See census returns for 1841, 1851, 1861 & 1871. There is some information on the firm on the British Museum website, and on Sotheby’s website. The death of Magnus Albert Phillips in 1847 is recorded at St Martin-in-the-Fields; with thanks to Jacob Simon for this information. This reference comes with thanks to the Jewellery section of the V & A website. See also Mary Haweis, The art of beauty, 1978, p.104-105. Ralph Wornum, art historian & later Keeper of the National Gallery, noted in his review of the Great Exhibition that, whilst NeoLouis items were the most numerous, the most popular were 16th century Renaissance. See Edward Joy, English furniture 1800-1851, p.153. Owen Jones, The Grammar of Ornament, 1856, p. 20. Hunt’s The awakening conscience and Rossetti’s Self-portrait both have Green’s label on the back, the one on the former advertizing that he was a ‘Fancy Wood Frame Maker’; see too Judith Bronkhurst, William Holman Hunt, A Catalogue Raisonné, 2006, vol. II, p.296. By 1870, the firm had become Joseph Green & Co, and was taken over by W.A. Smith in 1871, the year in which poor Green was possibly confined in Camberwell lunatic asylum; however, Smith (presumably Green’s foreman) may have taken over in fact if not in name some years earlier, since in 1868 Rossetti mentions the ‘wiseacre who now rules the destinies of “Green’s”… His ways are of the shifty and mysterious order’. Hunt seems to have switched to Foord & Dickinson during the 1860s, but returned to Green in 1869, by which point Smith was almost certainly in charge. It is unlikely that a designer seeking to sub-contract work on behalf of the Prince of Wales would have trusted it to a firm, however formerly prestigious, which was going through a rocky period in the 1860s. For Green, see the entry on the NPG website, as in the previous note. Most of this information is from the entries for George Foord and Foord & Dickinson, NPG Directory of Picture Framemakers. See the NPG entry for Foord, ibid. : ‘Ralph Wornum, keeper at the National Gallery, noted in his diary, 15 February 1858, that he had “received from Ford’s the frame for the Quentin Matsys pictures, made from a design by Owen Jones” (information from Nicholas Penny, see National Gallery Archive, NG32/67)’. You are amazing! What a wonderful bit of detective work. Also, have been curious (as a frame-maker running my own shop) about the scale of these shops, and so was interested to learn that Green had 4 employees. How large, if you know, was Foord & Dickenson? Great sleuthing! Good for you! Thank you so much for the link; I’m afraid that I had never heard of Arthur & Lucia Mathews, and have no idea why Arthur would choose Egyptian imagery for Pandora (unless because he thought that, logically, it was a creation myth, and thus must pre-date the Greeks, and who came before the Greeks?). Would you like to write me an article about the Mathewses? – it would be intriguing. It’s a beautiful & striking frame, & perhaps he did know about Alma-Tadema [ ]… are there lots of others? – there must be; it looks so finished and achieved – a bit like Klimt, in some way. Green actually had 11 employees; I think that he was very successful at the height of his powers, and I find it very sad that he may have ended in an asylum. I don’t know how many Foord & Dickinson had; possibly even more, as it was equally successful, and moved, more or less, into the space that Green had occupied. Lots of what they did would be what you do; but they would also have had someone carving the reverse moulds, which is slightly redundant these days… I gather that dental mould material is the in thing. Please think about writing a piece for me – subject up to you! If you want to get into American frames, you absolutely have to include Arthur Mathews (1850-1945) and his wife Lucia Mathews (1870-1955). He was California’s premiere muralist and teacher of painting. It’s because of his devotion to the 19th C design reform ideal of restoring the primal unity of the arts under architecture that he embraced mural painting so strongly. It also inevitably led him, like the Pre-Raphaelites and Whistler, the latter with whom he studied, into designing and making frames. Taking advantage of San Francisco’s immigrant population of displaced European craftsmen, he tapped their carving skills but demanded that they turn from their conventional classical style of work and go directly to nature (as Ruskin taught), as well as to use lower relief carving more suitable to the practical limitations of furniture. Actually, it is thought that Lucia took the lead in the carving. The Oakland Museum has most of their work, and if you go to this page, http://collections.museumca.org/?q=category/2011-schema/art/arthur-and-lucia-mathews, you can browse the collection and find the frames. (One spectacular piece I’d never seen before is this one: http://collections.museumca.org/?q=collection-item/a6513243.) The museum published a large and beautifully illustrated catalog from their last show a few years ago. I strongly recommend it to you. You should also know about my wife’s biography of Lucia Mathews, found here: http://www.artsandcraftspress.com/BigPicture.asp?catalogid=381. May have something written up for you at some point, but I’m afraid I’m too busy, right now. Still, thanks for asking!